A special “proposal” on Little Ambergris Cay. Somehow, the Turks & Caicos Islands have managed to stay quiet in the world of sailing. Cruisers are either fixated on staying in the Bahamas or are racing ahead to get to the Virgin Islands. We always knew, when we bought a sailboat, it would have to be a catamaran. The reason? It would be a perfect fit for the waters right here. The author’s 34-foot catamaran is anchored in a secluded basin just off Little Ambergris Cay. All winter we’ve explored. We’ve seen the flamingos in South Caicos, snorkelled with a whale and its calf in Salt Cay, meandered along Duke Street in Grand Turk. Each island has had its own unique characteristics and given us incredible experiences, which we don’t believe we would have found elsewhere in the Caribbean. But in February 2016, I think we found the icing on the cake. 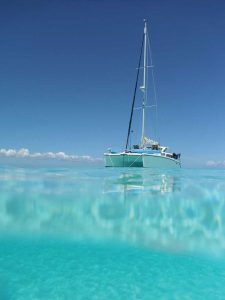 It is Little Ambergris Cay, where the shallow banks stretch to the horizon and water a bright duck-egg blue is specked with stingrays. It is several miles to the nearest island—Big Ambergris Cay, where only non-human residents live. We managed to sneak into a bay so secluded it felt as though the last people to have visited could well have been pirates. Its narrow entrance passage is around 3 feet deep, but once inside, a basin perfectly fit for our 34-foot catamaran encircles us in 10 foot depths of warm emerald-green waters. The grassy floor below attracts an array of inquisitive creatures, including a nurse shark who saunters past but doesn’t stay too long. Later, a dozen squid line up in a perfect row, facing the boat. They swim in perfect symmetry towards and away from our vessel, getting the courage each time to edge a little closer, wondering what on earth has arrived on their patch of the sea. At sunset, bonefish tails skim the surface over by the mangroves and at sunrise a hummingbird hovers outside our door, attracted by the shimmering gold and pink fishing lures left hanging to dry in the sun by the winch-handle holder. The beach is just as you’d expect for a deserted island—as white as pearls, as soft as icing powder. Despite being the epitome of a place to relax, I’m seduced into exploring its every inch. A short 10 minute walk reveals 21 pristine sand dollars—no wonder the sand is so white. I stop collecting them, as there are too many to carry. Having already spent two weeks away from land while exploring the other islands, we’re running short of everything. Water, food and gas are worryingly low. But we’re not ready to leave this paradise we’ve only just discovered. We ration more than ever before, even turning off our fridge to conserve the gas only for cooking. Luckily, we have a freezer that runs on 12 volts, so the little food left goes straight in there. One afternoon we head out several miles to a shipwreck to try bottom-fishing for our dinner. It starts slow, the only action is the seagulls that keep fleeing their perches on the rusty wreck every time the osprey circles above. As they all settle down we get our first bite. Half an hour later and we’re heading back to the bay with a healthy helping of yellowtail snapper, triggerfish and a grouper. We plan to cook the snapper that night on a beach bonfire. As we collected the wood for that evening’s fire I realise that it’s Valentine’s Day. “This will be the most romantic Valentine’s Day I’ve ever had,” I think as I drag a large branch across the beach to a spot right on the tip of the sandbar; a perfect sunset viewpoint with our boat as the foreground. We head back to the boat, grab some sparkling wine we’d saved for a special occasion and head back out on the dinghy. With the fire mimicking the orangey-red of the setting sun, my partner Andy hugs his arms around my waist as he turns me toward him, and I start to feel an unusual energy about this moment. “There’s only one thing left to say . . . will you marry me?” he asks nervously as he bends down on one knee. “Of course I’ll marry you!” I say as a tear rolls down my cheek and I try to recover from the shock. We hug each other tight and kiss in celebration. “I was going to buy you a ring but I spent the money on two new engines instead,” he jokes as I reach to top-up our fizz. (I had been wondering about the ring!) But in typical Andy style, he’d been trying to fashion me a ring out of a conch shell, which unfortunately had proven far too tricky to handle. All of a sudden the flight back home to England seemed much more appealing, now that we’d be making an unexpected stop in New York for a ring along the way! Katie Gutteridge is a freelance writer who has been visiting TCI for almost a decade. Unfortunately, she won’t be getting married in Turks & Caicos, as she’s planning a large wedding party at home with friends and family. For more information on her business, Creative Copy Kate, visit creativecopykate.weebly.com.